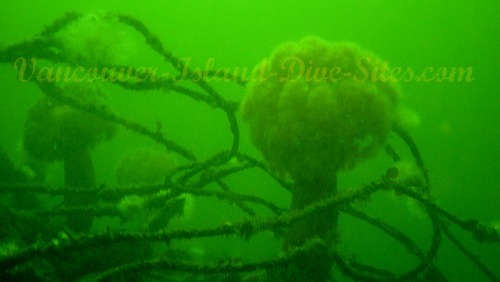 The wreck of the Robert Kerr, just north of Thetis Island makes for an excellent, and historic scuba dive. The remains of the Robert Kerr, a converted Barque that sunk in 1911, are surprisingly intact and still identifiable considering how long she has been under water. 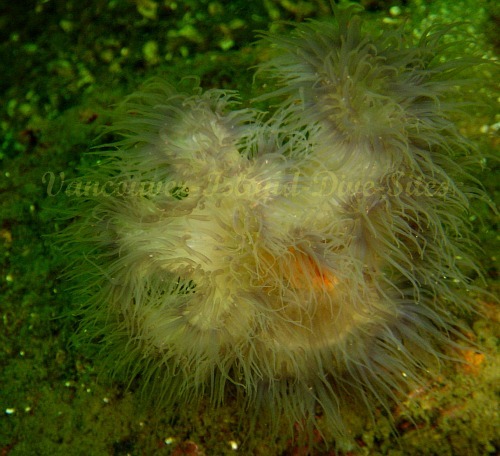 There is also lot's of marine life that lives on or around the wreck. Various Anemones, Scallops, and fish are evident in large numbers. We even had a curious Sea Lion nipping at our fins! This site is accessible only by boat, and at less than 60ft (18m) in depth, it is available to all levels. (Much of the what remains is in only 20 to 30ft, (6-9m). Being a shallow dive, at least it gives you ample bottom time to explore the wreck. You can reach the site from either Ladysmith, Chemainus, or even Cedar in south Nanaimo. The site is marked on Marine Charts for the area as a wreck, and is located on a line between Ragged Islet and Miami Islet. Modern sounders with GPS will take you right there! The Robert Kerr is one of the few wrecks to be recognized under the B.C. Heritage Conservation Act. Look or photograph, but don't touch! Please be very careful to anchor off of the site! There was a new plaque placed at the site 100 years to the day of it's sinking, (March 4,1911) that has some interesting facts about the ships history. Be sure to check it out. The plaque was placed there by the Underwater Archeological Society of British Columbia. "The Ship that saved Vancouver"
She became a refuge for residents who were fleeing a huge fire that tore through the city back in June of 1886. As I believe was said, this is a not only a great dive, but a part of our Maritime History, be sure to add this to your, "to do" dive list.